Mobile OTT gaming company Weeby.co has announced the launch of its first game, Doki Stars, a match-two game on the Kik Messenger browser. Kik users can access the game with a single click, competing in tournaments and challenging their friends as they play. Developed by Weeby.co partner Mojo Forest, Doki Stars presents players with numbered tiles, and asks them to tap on two tiles with the same number to remove them from the screen. Players are challenged to earn as many points as possible in 60 seconds, and can replay the game repeatedly to increase their high score or challenge more players. Doki Stars is the first of many upcoming games from Weeby.co, which will run on additional OTT messenger networks, including Line, WhatsApp, Tango and more. By developing for messaging networks, the company’s games can be played on any device, regardless of OS. 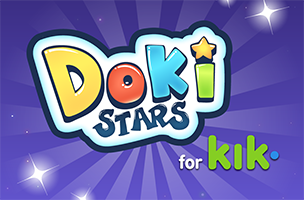 Players can access Doki Stars by searching for the game in the built-in Kik web browser, which was added to the platform in early February. Kik has over 100 million users, and allows users to share web experiences with others without leaving the app.